Well, hello there! I know, it's been, well, ages since I logged in to write a blog post. 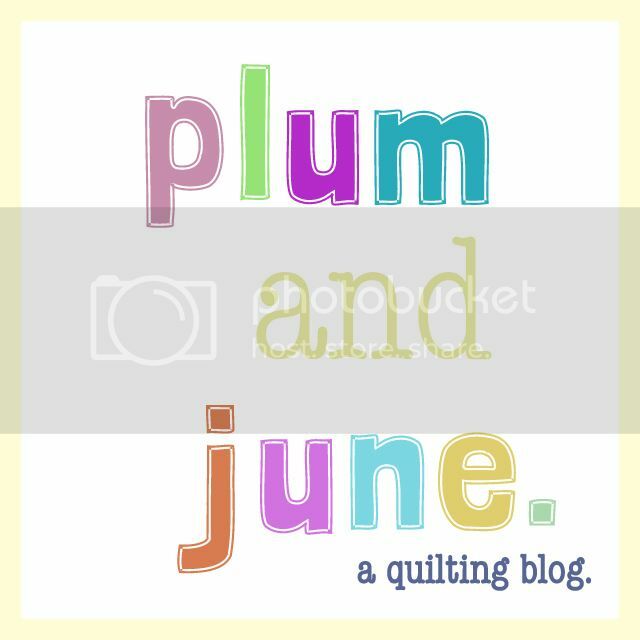 But, when your good sewing bud designs an awesome block, ask you to make a block and then blog about it, well, that's a good enough reason to dust off the ole keyboard and post! So, my bud, Lee Monore, AKA, May Chappell, has created a super cute, super easy to do block called "Love All Around". It's basically an hourglass block, some flying geese and half square triangles all assembled to make chevrons that remind one of hearts! We could all use a little love, right? So this sweet block is an homage to friendship, kindness and love. It's a way to think about how I, personally, can be a kinder person and how I can be an influence for positivity this year. Here are the two I've made so far. 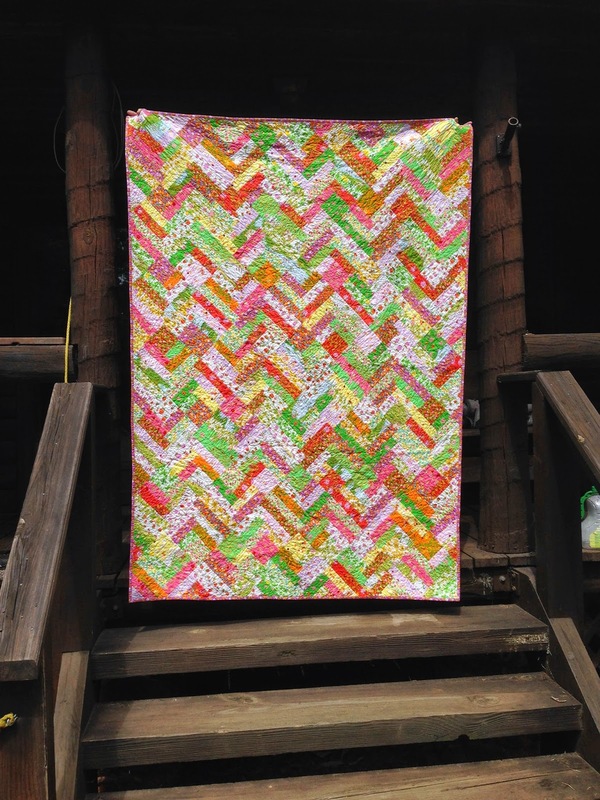 I'm going to make a bunch of these, and try to use up a ton of scraps and make a scrappy love quilt! Recipient to be determined! Go to Lee's website for a tutorial of the block. Thanks for taking the time to stop by! Check out all the other folks who have made some love blocks on IG or on their blogs. 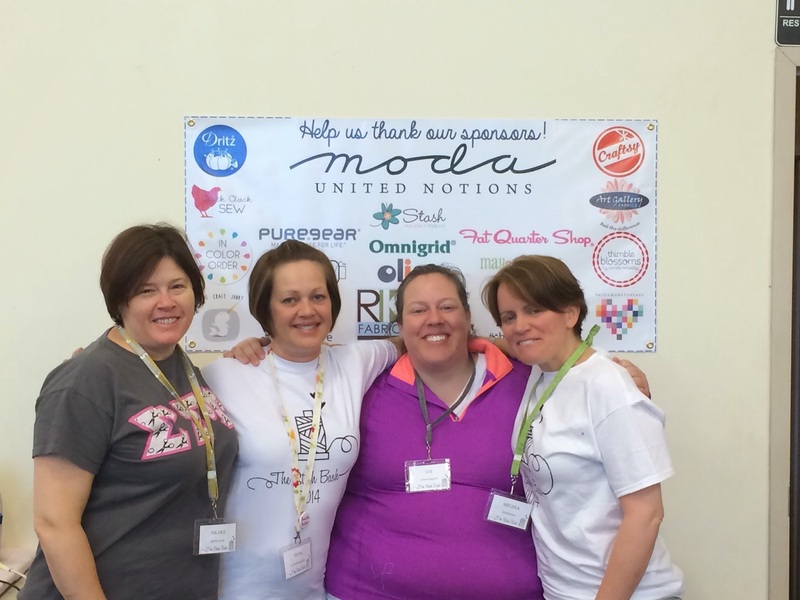 Quilty peeps are the best peeps for sure! 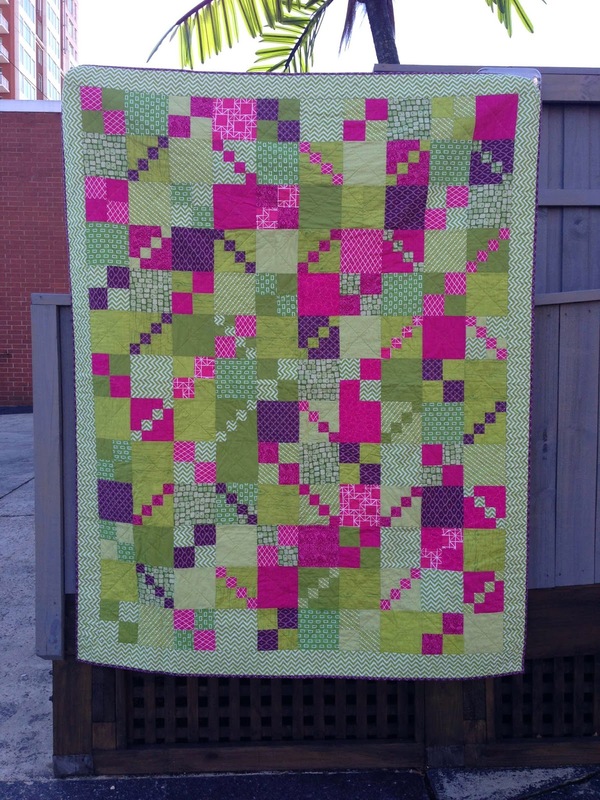 For March's quilt, I'd like to do a variations on the Churn Dash block. 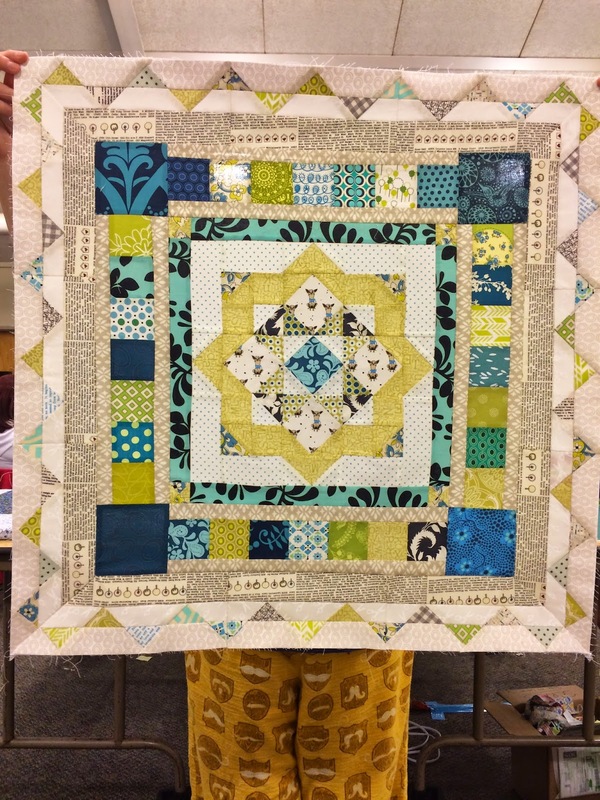 The Churn Dash is my all time favorite traditional quilt block. 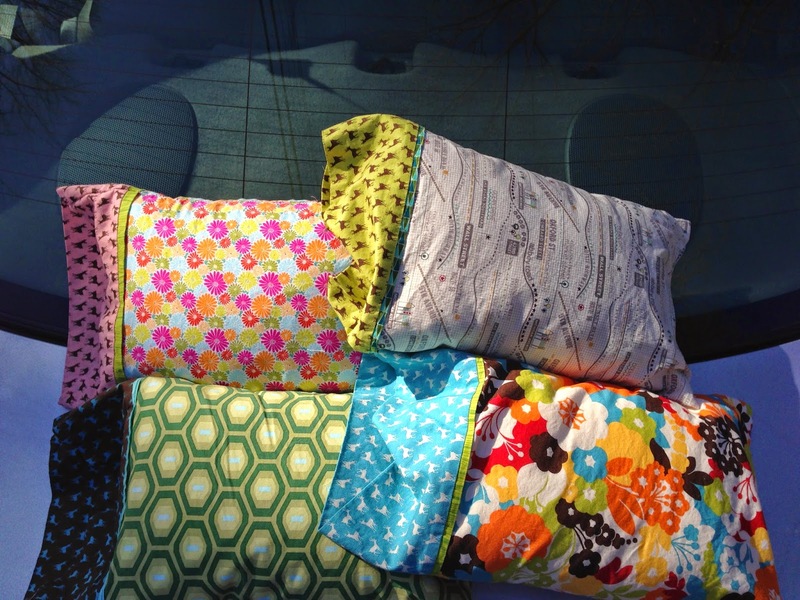 I love how you can change up the fabrics and color ways and create lots of variations! Below is a diagram of several variations on the Churn Dash. Most of them use the 3x3 grid, with all squares being equal sizes, but some, like the Wrench, Puss in the Corner II, Ruins of Jericho, Whirling Five Patch and Grandmother's Choice and Grandmother's Choice II, though all use a 3x3 grid, the spacing of the grid is not equal. This is a diagram I did for fun; in no way do I expect the color layout to be exactly as I show. This is an idea of what you can do! 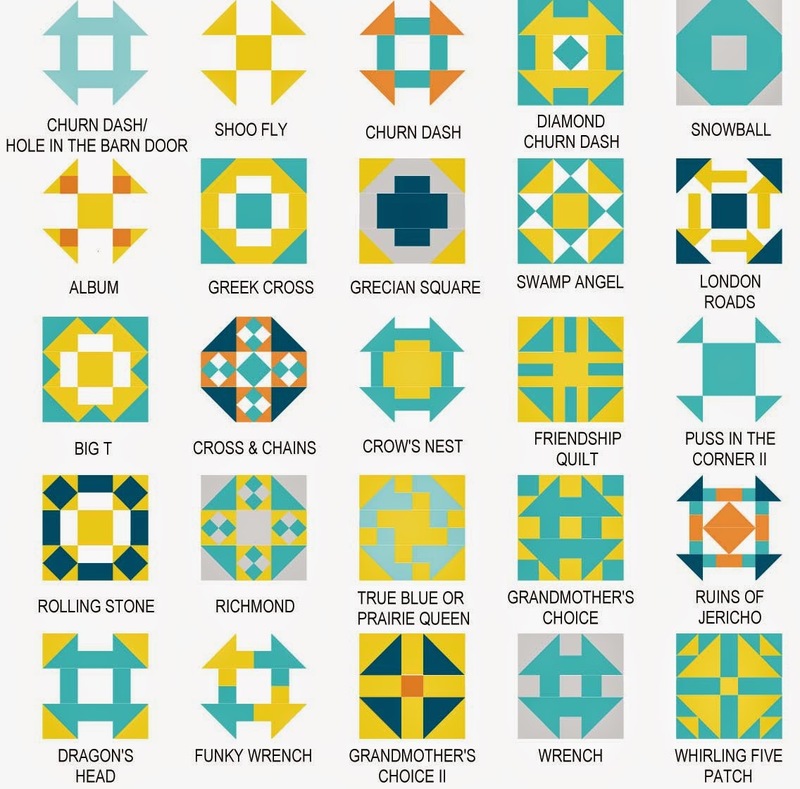 You can find a lot of these quilt blocks, with directions, online. 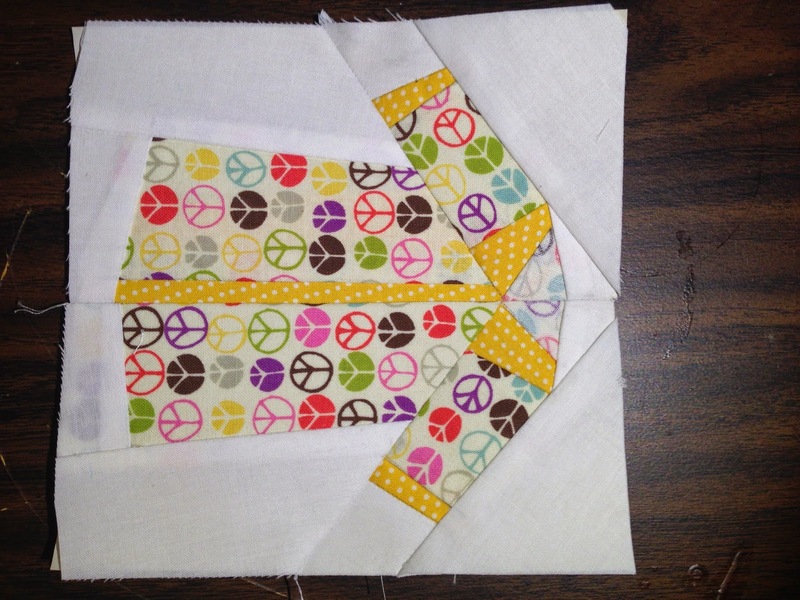 Several of these come from the book, 501 Rotary-Cut Quilt Blocks by Judy Hopkins. I am happy to share cutting/assembly directions with you if you want to do a particular block and cannot find online directions. Just let me know! 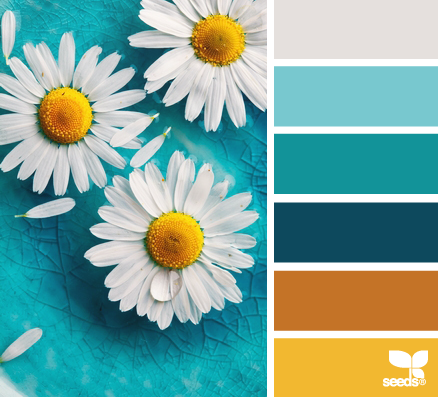 Please create your favorite version of the Churn Dash using the Design Seeds color scheme below. You can use the light gray, white or low volume as your background. I'd like to avoid a creamy background for this project please. Or you can do one of the colors as a background (as I show in the diagram). Feel free to use solids or prints. Mix up the colors if you'd like. Make it modern, make it yours! Piece and Quilt did an Urban Churn Dash sew along at the beginning of this year, and that is also a neat block if you care to check that out. It's also on IG under #urbanchurndashsewalong. These blocks finish at 24" . . . Which leads me to size. You can make two 12" x 12" finished blocks, or if you want to make one super-sized 24" x 24" finished, feel free. You can even make a few 6" x 6" blocks as well. I just want them to be finished square and at a size divisible by 6. Make what is the equivalent to our usual two 12x12, however you want to divide that up. Please let me know if you have any questions! I look forward to seeing what you all create! I am so excited to be going to my first ever Quilt Con! In case you don't know what Quilt Con is, it is a conference held in Austin, TX by the Modern Quilt Guild. This is the 2nd year, and the first was in 2013. Good news is that starting next year, they will be holding the conference every year, but it will switch between the East and West coasts. Next year, it's in Pasadena, CA and in 2017 it's in Savannah, GA! You can bet I'll be going to that! So, I feel enormous pressure to travel handmade. I mean, check out the #travelhandmade hashtag on IG. You'll see what I'm talking about. The stuff peeps make is outrageously awesome! Serious talent out there. Because I don't have much handmade stuff, that means I needed to crank some shiz out! There is also a lot of (self imposed) pressure to do something awesome. Awesome to me means great fabrics and a great pattern. So I decided to make the Trail Tote, by Anna Graham over at Noodlehead. This FREE pattern comes in two sizes and I chose to make the larger size for toting all my junk around in Austin. I used some new Cotton + Steel (a Sarah Watts design - - lurve it) with some Echino airplanes. I found some gray faux suede in my stash (forgot I had that) and used that for the straps and piping. Speaking of piping, this was my first time sewing piping, let alone making it. But it was easy and I think it turned out great. 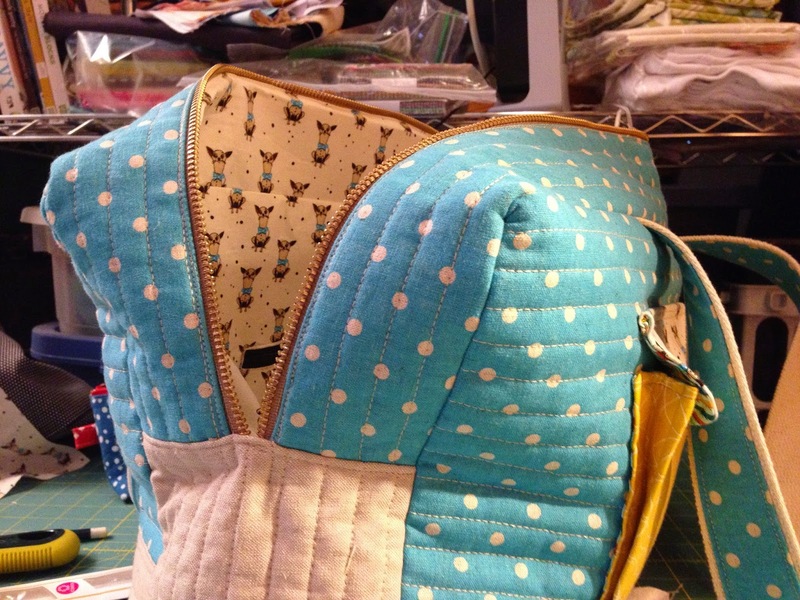 You can make piping w/ a zipper foot! But I think I'll invest in a cording/piping foot in the near future. Back to the bag. The pattern is easy to follow, though the instructions were a little vague on the strap pieces that are attached to the bag. If you stumbled upon this post in regards to the Trail Tote, just know that the pieces need to face down into the bag! Ha! Makes sense, but she doesn't tell you that. Ask me how I discovered it! You know it! Seam ripper time! The large size is really a big ole bag! I'm used to carrying a smaller bag, so I will be able to carry my Ipad in my bag for my trip. I also decided I would need a more traditional tote bag, when I remembered I never sewed my Park applique pattern into the designed tote bag! I took Carolyn Friedlander's class back in August 2014 (it's a good class, so if she's coming near you, take her class). 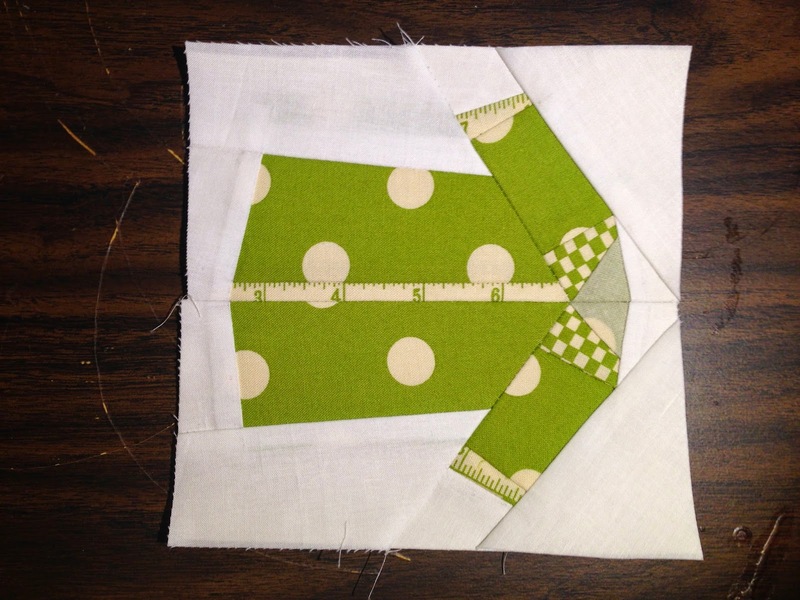 It is a part of the slow sewing movement and the pattern is in her Savor Each Stitch book. It's a beautiful book and the Park project was really nice to work on. Hand work allows me to be in the same room with my hubby so we get some time together instead of me being back in my sewing room. Or the atelier. That's a fancy French word for "workshop"! It makes my basement, no window having, sewing corner sound much better than it is!! hehehe! 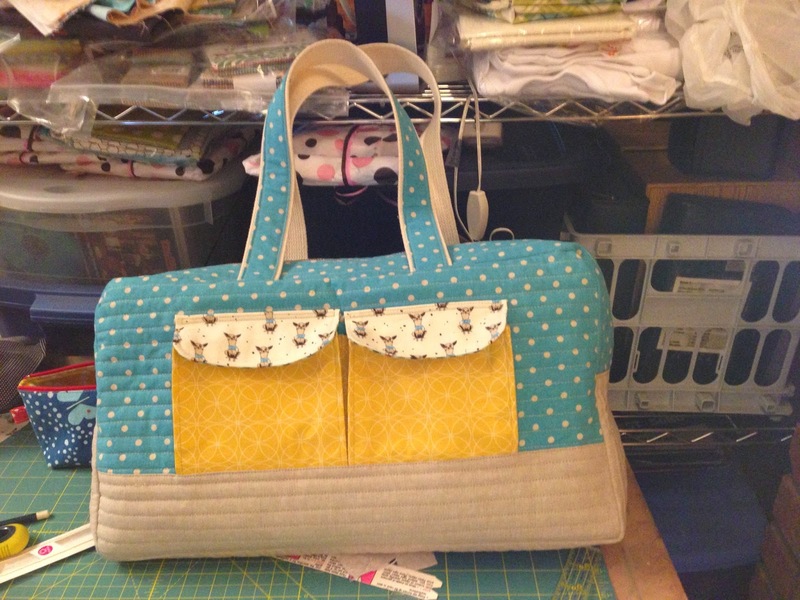 So, Carolyn has a tutorial on her blog about how to make the tote. I used store bought piping (I'm now a master at sewing this stuff after the Trail Tote) and I had webbing on hand that I used for the handles. Now I have me a spiffy tote to tote around Quilt Con. The bag is a Lotta Jansdotter print, with Sweetwater Reunion for the design. Oh, and I sewed the handles down skinnier after I snapped this pic, so it looks better! Now I look like I've got some sewing skillz (even though I really don't . . . shhhhh) with my 2 awesome bags!! I'll post from Quilt Con. If you are going, look out for me. I've got buttons to trade! 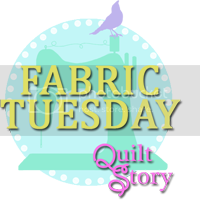 Linking up to Quiltstory's Fabric Tuesday! I've had a few finishes in the new year, so I thought I'd share them with you! First up is my nephew's quilt. He's the youngest of my sister's kiddos and he asked me this summer, "Where's my quilt?" You can see the one's I did for the other two, here and here. I purchased the fabric for both nephew's quilts at the same time (Emily Herrick's Hall of Fame and the pattern is her's too, though I can't remember the name), and I started Sawyer's quilt first. I put it away for about 2 years, and when I pulled it back out, I realized what a crappy job I had done of sewing and cutting! Argh! Not consistent 1/4" seams, and wonky stitching. . . Anyway, I finished up the blocks and abandoned the sashing I'd cut and arranged them on the design wall. The quilt came together quickly. Though once I started quilting the bad stitching and not so great basting reared it's ugly head! I did simple straight line quilting, but the quilt was so wonky and puffy in places, I had to go back and do some cross hatches to keep the fabric down. Once washed, it looked better. And Sawyer was so happy to get his quilt. That child is always cold, so I hope he uses the heck out of it! Another finish I'm so happy to have done is my A is fo Apple . . . Z is for Zebra quilt! This is for baby Otis, my back door neighbor's new pride and joy. He was born in September of 2014. I started this quilt in August and finished it up Friday night. It was gifted to Otis this weekend so I'm so happy to share! 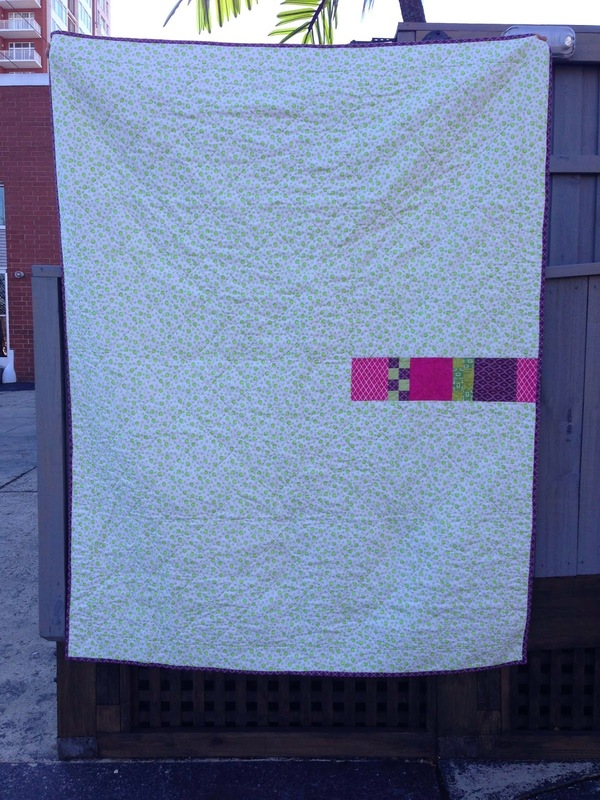 I am very proud of this quilt, as it's designed by me, based upon an image I stumbled across on Google! 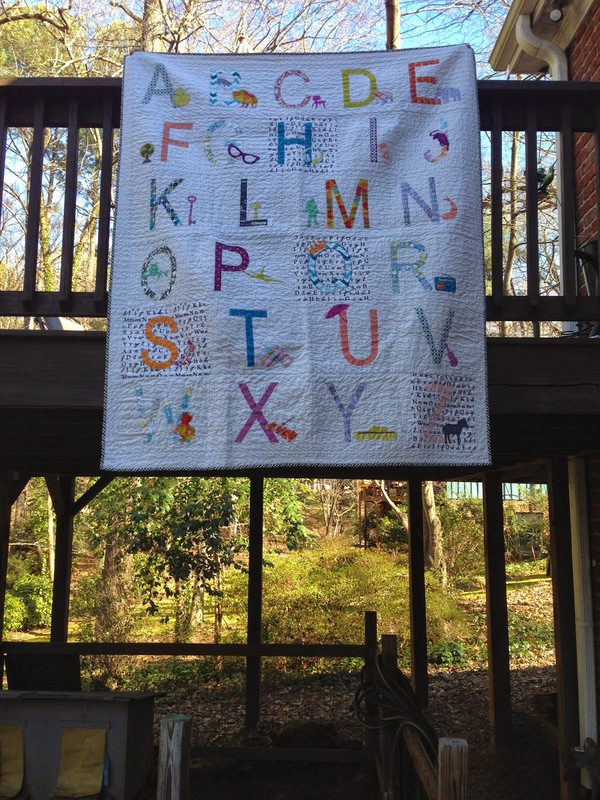 I designed all the letters and their objects and printed them out, cut them up, and cut them out of the fabric. 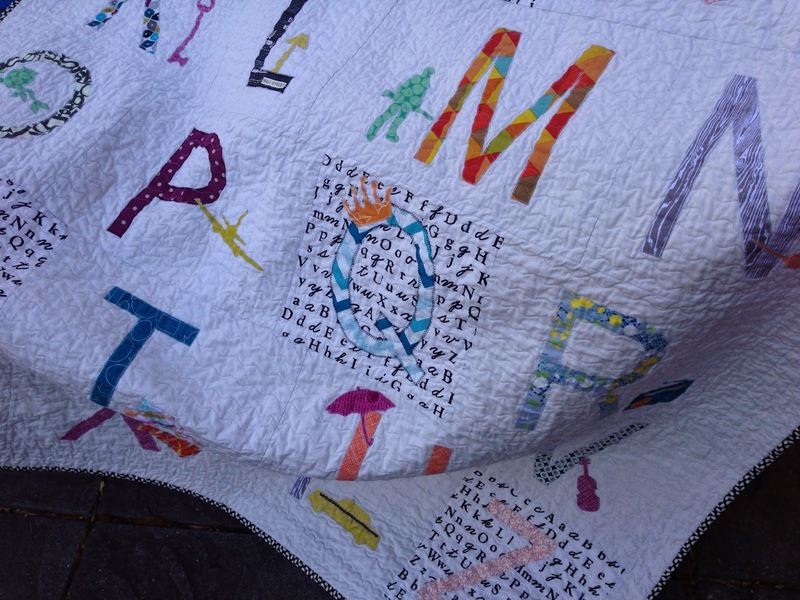 All the letters are fused to the background fabric, then I zigzagged stitched around them. I decided to do the alphabet because that's how Otis' room is decorated. 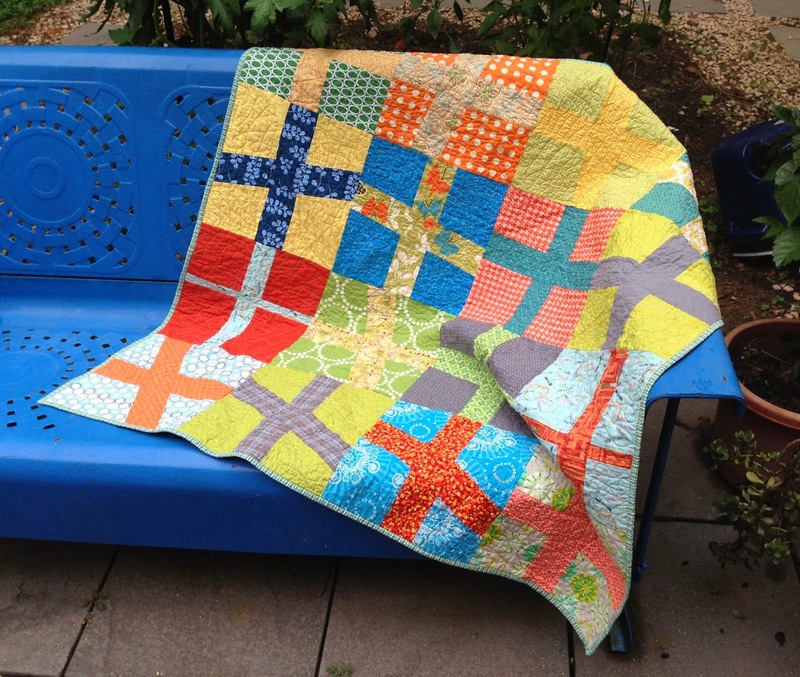 I chose fabrics that I love and objects that mean something to me or to Otis' parents. They went to Bucknell and Frostburg, so the "B" has a bison and bobcat! NC State and West Virginia is where they did their masters work, so the "M" has a mountaineer and the "W" has a strutting wolf (Go Pack!!). The "N" is my favorite; you gotta love narwhals! But I also love the "Q" and the "G"! 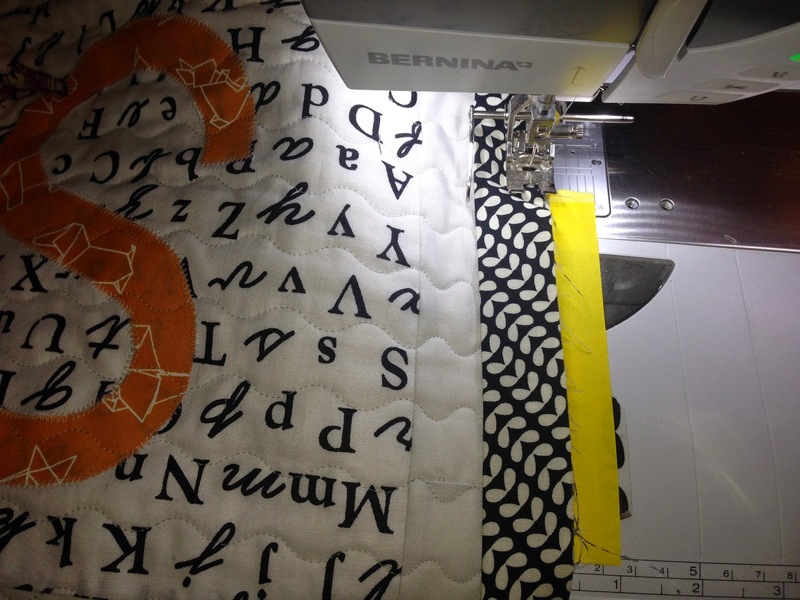 I discovered a new stitch on my machine (Bernina #4) and set it to 3.0 and quilted away. I love the texture! I bound the quilt in Sweetwater Elementary Biology Black and I love how it turned out! Machine bound this too. I'm getting better at it but I still need to practice, practice, practice! I'm thinking about turning this into a pattern . . . Fabric: Moda Feather for background, various lines including Architextures, Mirrorball Dot, Frippery, True Colors (Joel Dewberry), Road 15, Mixed Bag, Collage, Notting Hill, A is for Alphabet. Most of this was purchased at SewLux Fabric! Go check them out! Now I gotta get ready for QuiltCon! There's a bag in my future . . .Of course I'll share it here! The Best Set Intentions . . . I had such hopes for last year . . . As you read in my 1 (yes, that's right, O-N-E) blog post! Sigh . . . But, it's a new year, and I did sew a lot last year, so I'll share some old and new stuff, okay?! I made some shirts for my friend, Lee of May Chappell, All Shirts No Shoes swap! 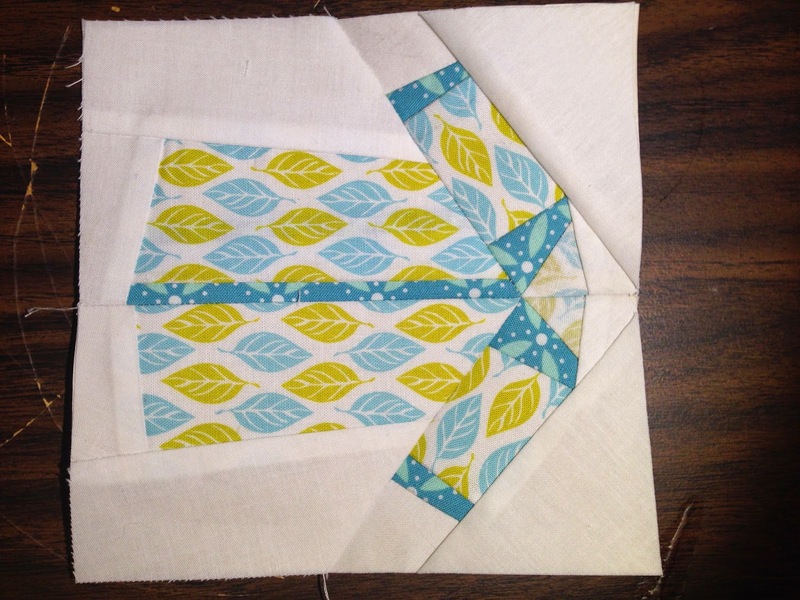 We used Carolyn Friedlander's Shirts pattern. Lee has another swap going on now. You should sign up! 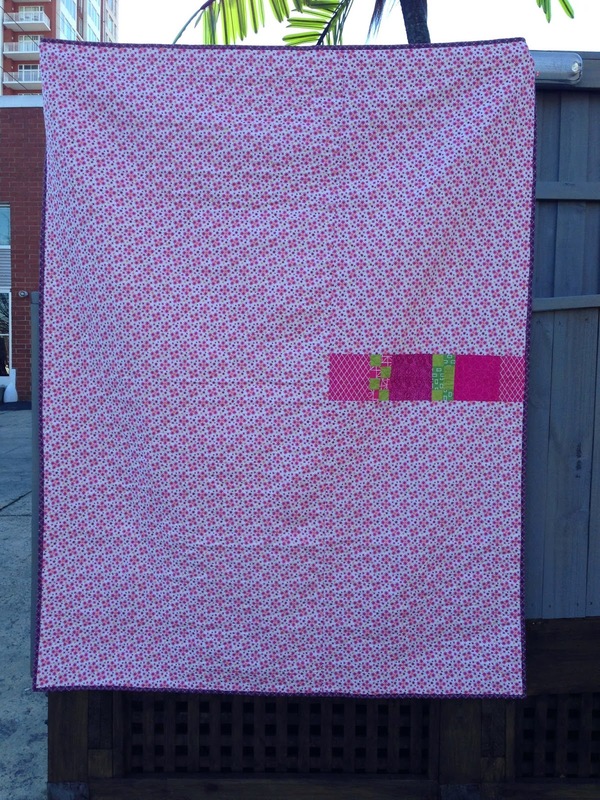 I finished up the Valentine's themed quilt made from Lee's Lazy Sunday pattern. I love how it turned out! I bought a fleecy throw on sale at Target and backed it with that! So warm! I also made some travel pillowcases for my husband, myself and my in-laws for our cruise last March. These were clutch for the drive down to Jacksonville! I was set up with my pillow and my quilt! My SURMA group decided to do a small swap for those of us that didn't go to Sew South last year. I drew Lee's name and made Noodlehead's Cargo Duffle for her; ok, really for her dog, Mack the Chihuahua. I used some Chihuahua fabric for the lining and the front pocket flaps! Mochi dots and Essex Linen in Natural and Comma Swing in Mustard round out my fabric choices. 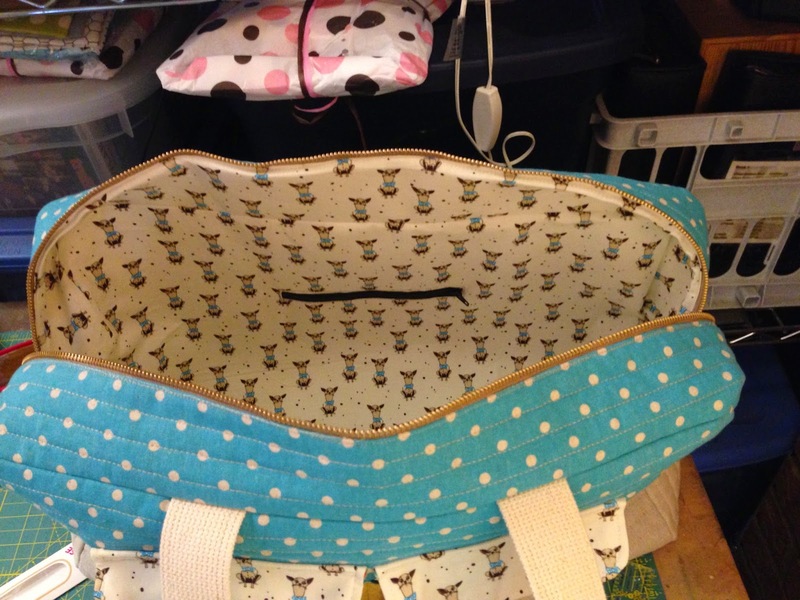 I ended up using webbing for the handles and accenting them with the Mochi dot fabric. 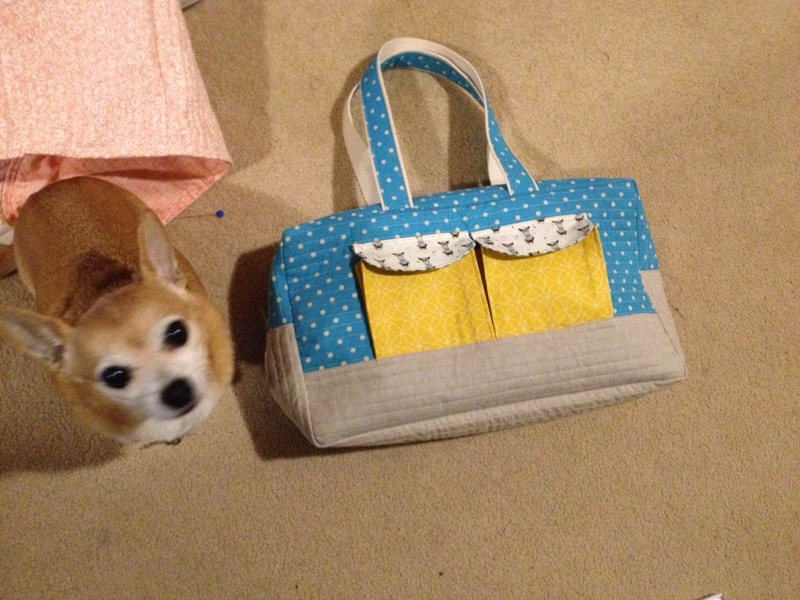 Here is a pic with Mack the Chihuahua posing with his new bag! I also went to The Stash Bash last year and I'm happy to say, I'm returning again this year! My SURMA friends, Tessa (The Sewing Chick), Lee and Melissa also went. We had a blast! I worked on the SURMA center in my possession, which was Lee's. I finished up the paper pieced border and sent it on to Sarah (Stitching and Bacon) to add her border. Hopefully (finger's crossed) we'll be getting these finished up this year! 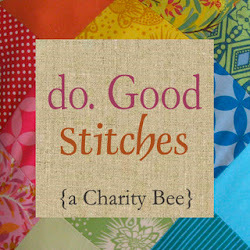 I'm in the Believe Circle of do.goodstitches and for my quilting month, I had my beemates make Scottie blocks with bowties in yellow, green and pink. It turned out so great! 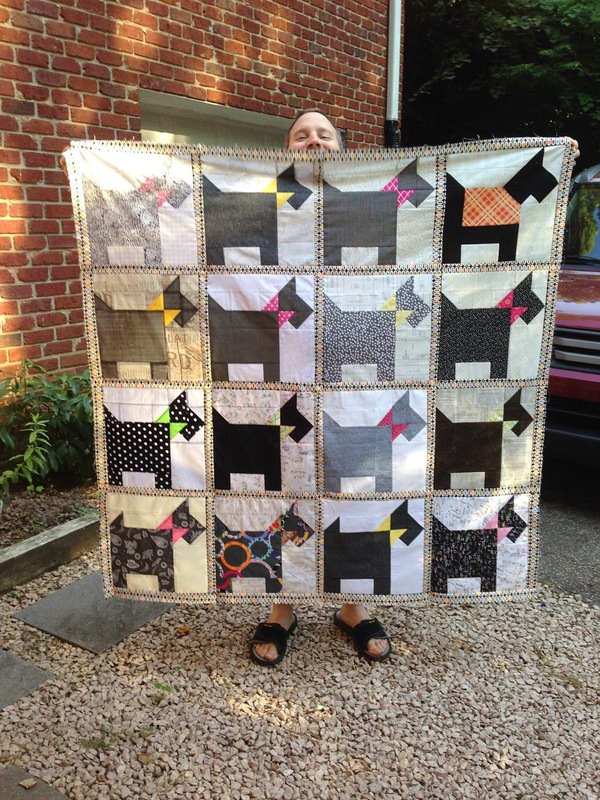 I made the back and made bones blocks to go with 2 extra scottie dogs! This is on my current TO DO list to get it quilted and bound! Look at my cute hubby poking out from behind the curtain! 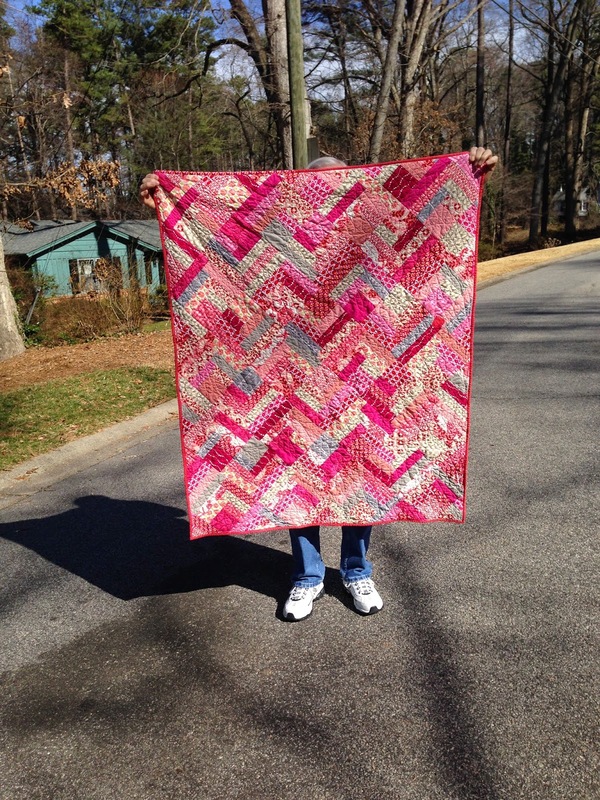 One of the big things I did this year was make 2 quilts for my parents in honor of their 50th wedding anniversary! 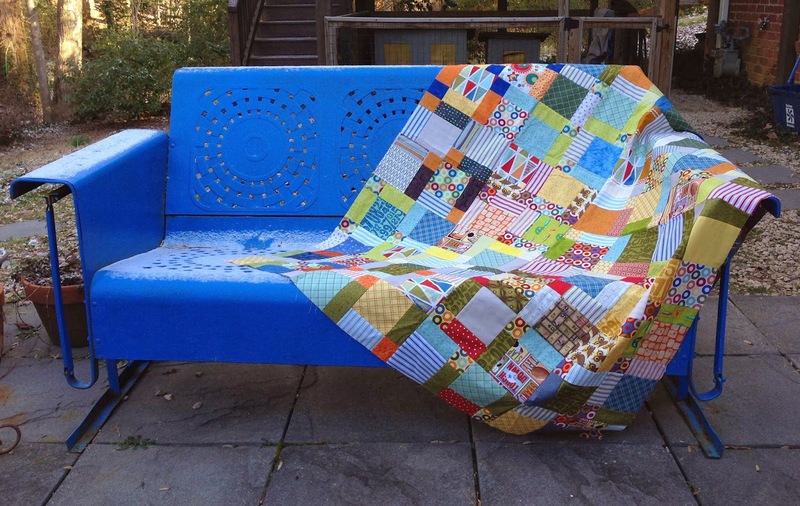 I used Lee's Lazy Sunday pattern for both of these quilts and made them twin sized. For my dad's quilt, I used Road 15 from Sweetwater. He's a retired Driver's Ed teacher and I thought the theme was perfect for him. And I happen to LOVE Sweetwater and this line in particular! For my mom's, I used Briar Rose from Heather Ross. The strawberries remind me of my grandmother and I knew my mom would love that and the sweet mama and baby frog hanging by the pond! They were both so tickled and I was so happy to be able to give them something that honored such a tremendous event in these days and times! And with that, I think I'll do another post with some other finishes I had last year! Happy 2014 fellow sewing friends! I hope you are having a great start to your sewing year! I got a lot accomplished in 2013, but I felt like I wasn't sewing for me. Meaning, I think I over-committed myself to bees, swaps and the like, and I didn't have anything physical to show that I had made. So, this year, 2014 will be the Year of Selfish Sewing. For me, that means working on the projects I want to do and sewing some personal projects for me along the way. I've dropped all swaps and bees, except do.good.stitches. I'm staying in that bee to have an outlet to practice free-motion quilting and not be intimidated by it "not being good enough". 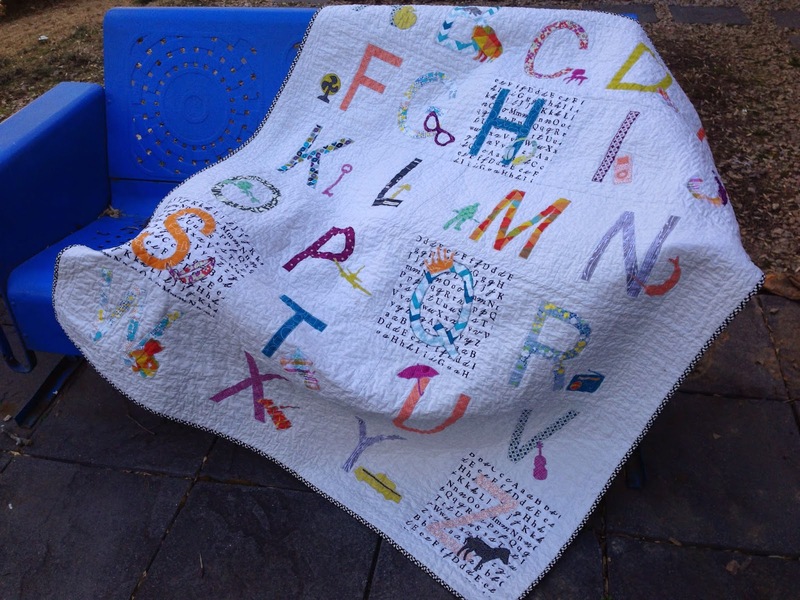 Don't get me wrong, I do good work, but the quilting is by no means perfect, and this give me a place to practice, knowing the recipient will love the quilt, no matter what. 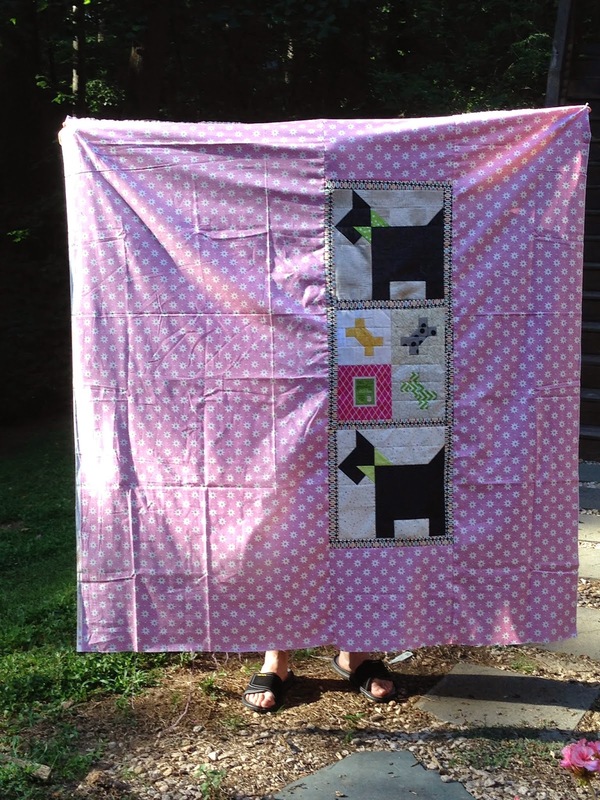 My first 2 finishes were commissioned quilts for one of my college friend's little girl. They are giving her bunk beds for her 5th birthday, and she wanted quilts for the beds. I bought a boat load of fabric from Sew Lux and with the help of Chrissy, Sarah and Lee, we picked a palette that my friend requested and loved. Green, pink and purple. 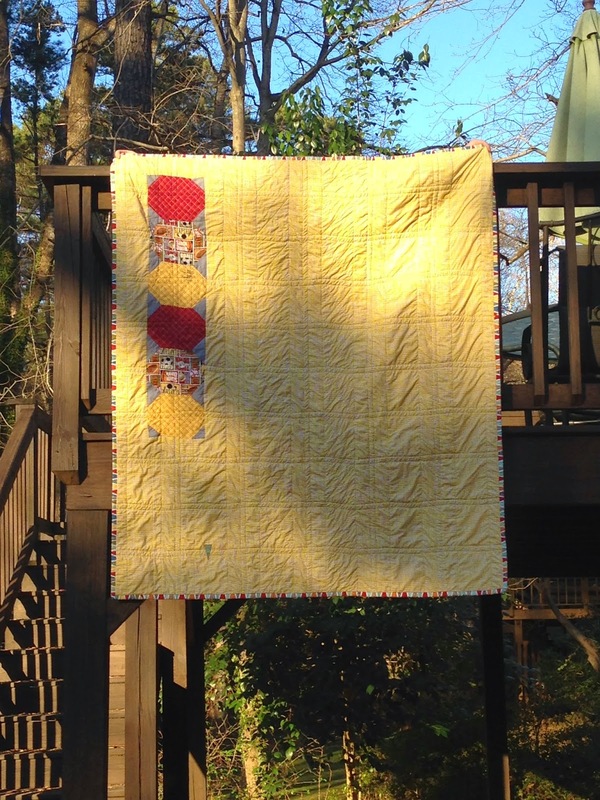 I used Stitched in Color Rachel's Penny Patch pattern for both quilts. Both use the same fabrics, but the placement of the square is not identical. To give them a little more size, I used the same chevrons as in the quilt, as a border. I quilted them with straight lines on the diagonals. I binded them both in Simply Style Eyelet in Purple. My friend and her daughter were thrilled with the end result! Now they have to get the bunk beds finished! 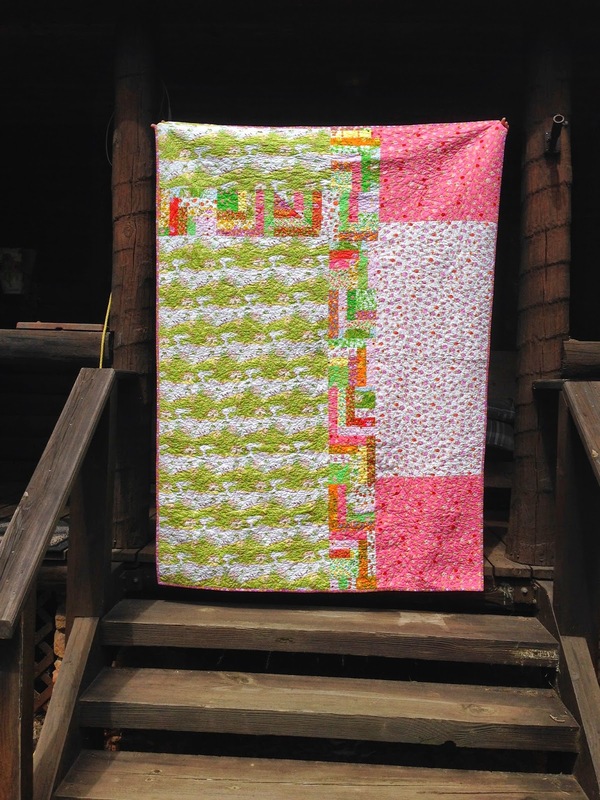 Last weekend, I went to my sewing besties' mountain home for a Mother-Daughter Sew Down. I got a few things sewn up, and my mom made her first quilt blocks! We picked out Churn Dash, Sawtooth Star, Shoofly and Turnstile blocks to work on. 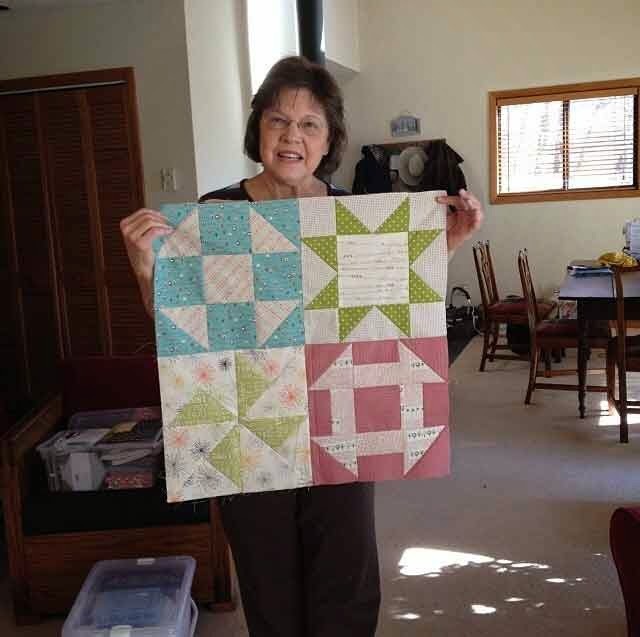 She did a fantastic job and now wants to work on more quilt blocks to make a whole quilt! Go Mom! I put together the June 2013 blocks and October 2013 blocks for the Believe circle of do.good.stitches. 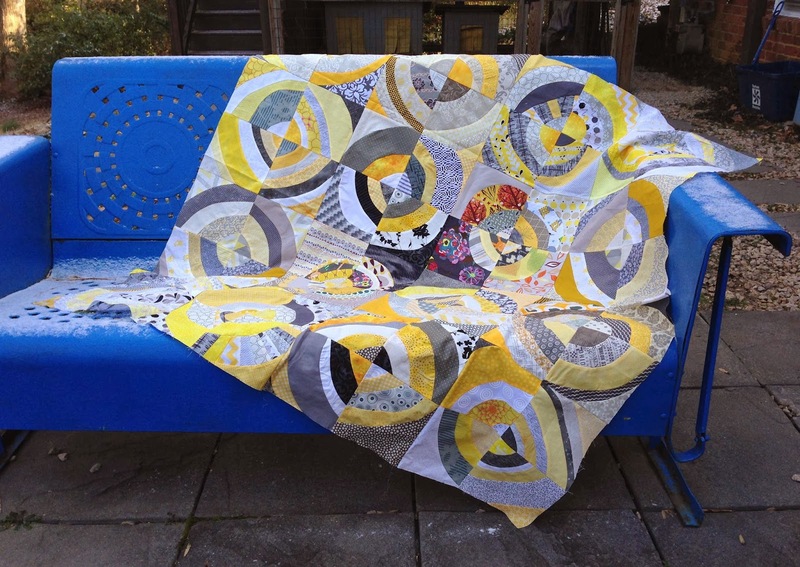 For June, I had my beemates use Katy's (I'm A Ginger Monkey) Wonky Bullseye pattern, in yellow, gray and black. This was a challenging (curves) but fun block and I think they all did a great job! 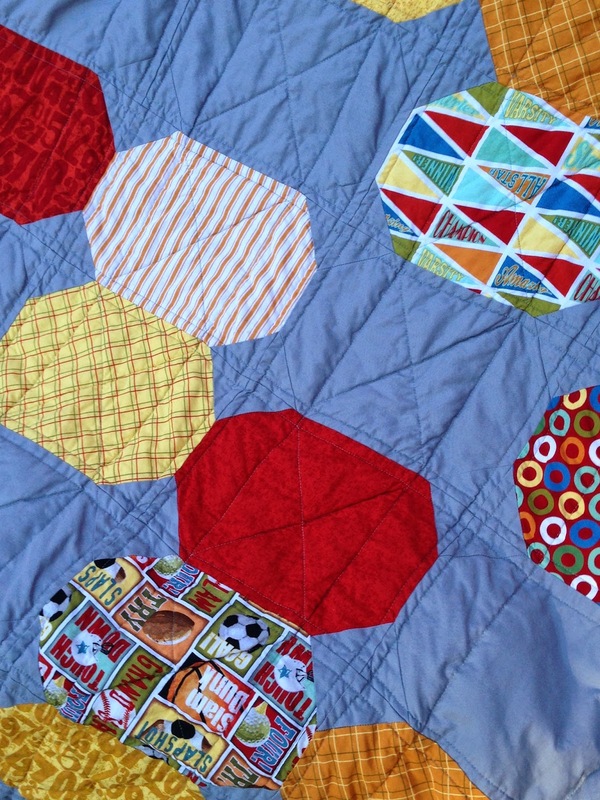 For October, I sent my beemates leftover fabric from my nephew's quilt and had them supplement from their stash to make disappearing 9 patch blocks. 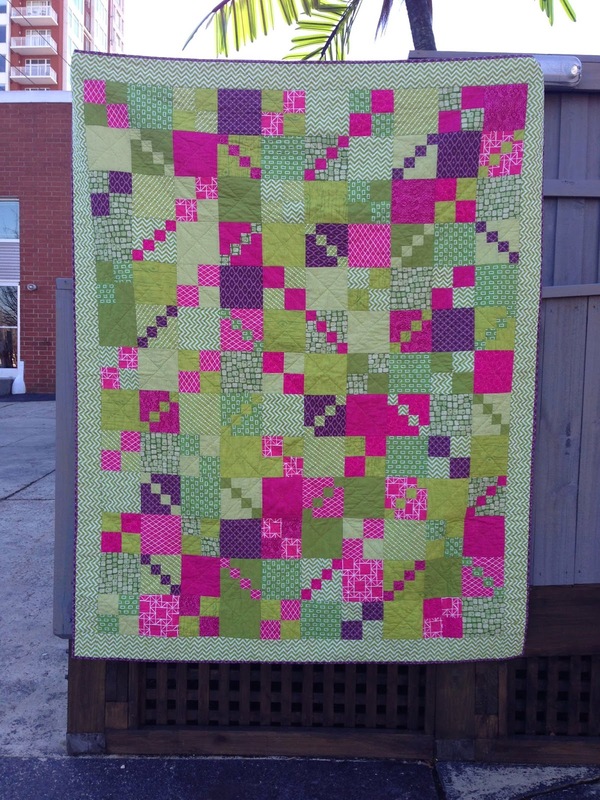 I love this block and how it makes a great scrappy quilt top. Now, to finish these two off and send them out to My Very Own Blanket. 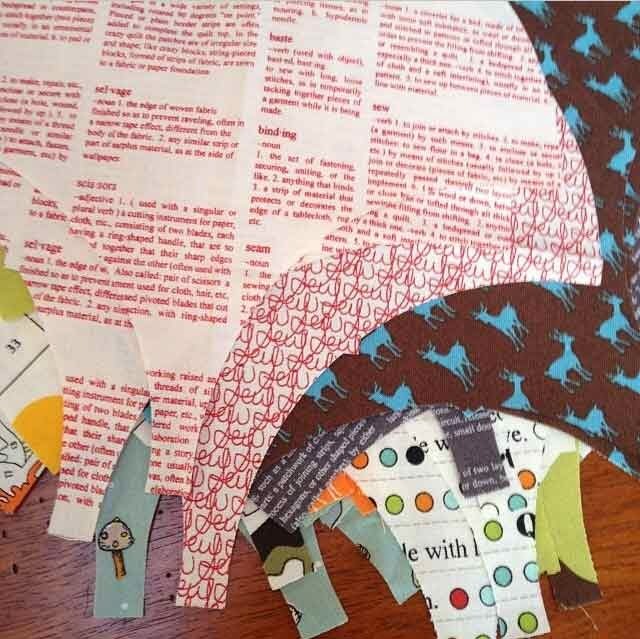 I also brought fabric to cut into clams with Lee's Accuquilt. I got some of them cut and will just have to make an appointment with Lee to cut the rest! 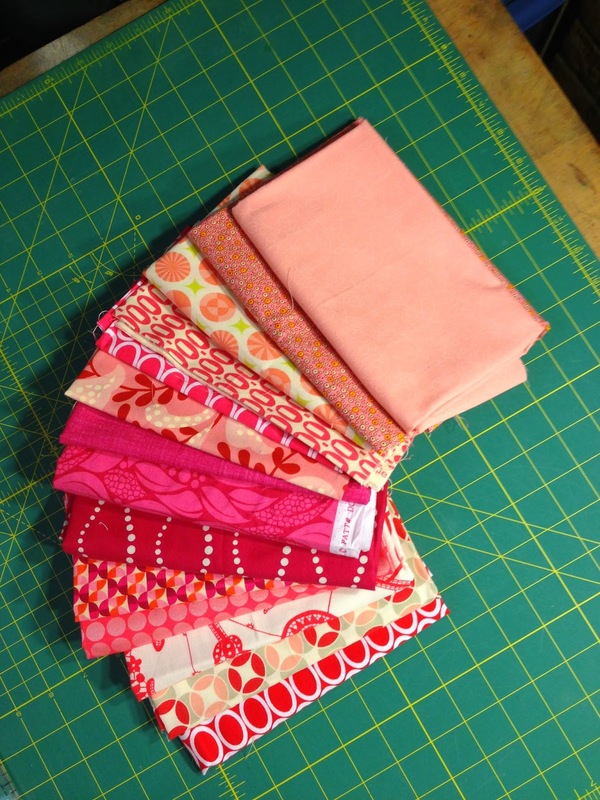 I'm loving the fabrics I choose: Oh Deer!, Mama Said Sew, Lush and Collage to name a few! Not a bad start to the New Selfish Sewing year! 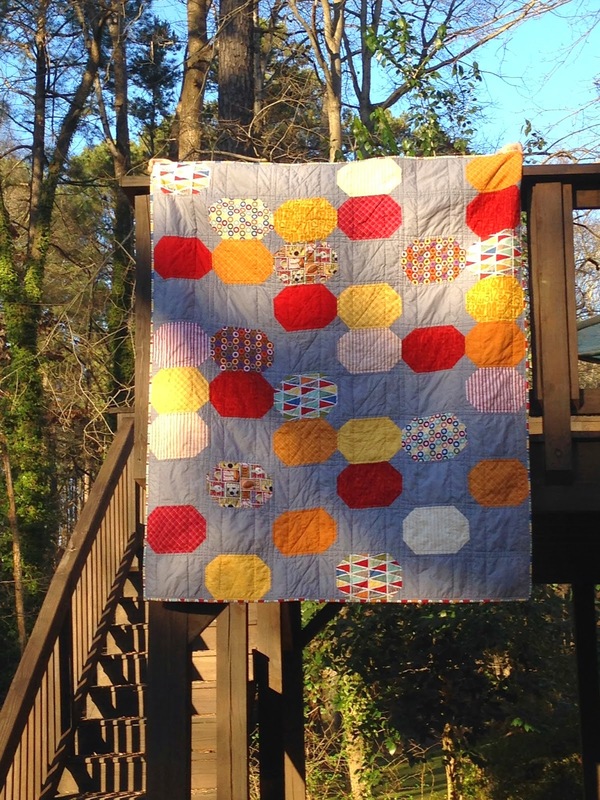 I pulled fabrics last night for Sew Lux's Lazy Sunday Quilt-Along (my friend Lee's pattern) that starts this week! 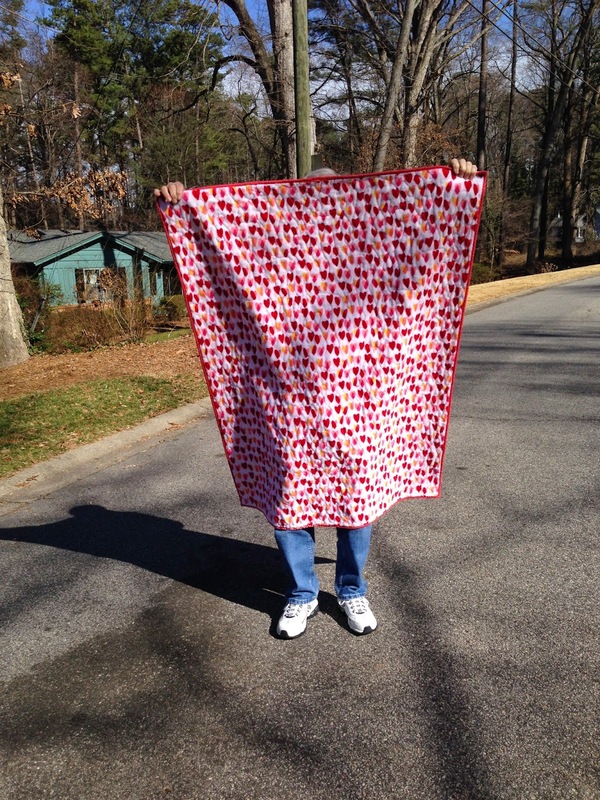 I'm going to make a Valentine's Day quilt for me! Yeah! 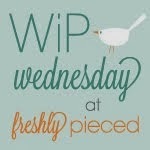 Linking up to Lee at Freshly Pieced for W.I.P. Wednesday! 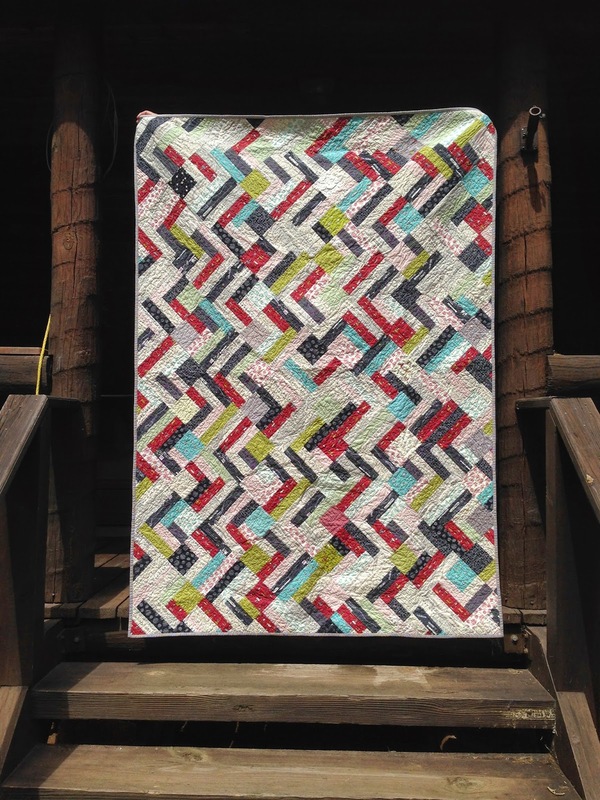 Post #2 today: I'm entering another quilt into the Blogger's Quilt Festival, over at Amy's Creative Side! Head on over there and check out all the amazing-ness! I decided to enter my bee quilt from March (the awesome gals of the Believe Circle of do.good.stitches helped out on this one), into the Quilt Photography Category. I know what you're thinking: Why not the Group or Bee quilt category? Well, I've had so many comments and compliments on IG, Flickr and Facebook regarding how the quilt is photographed, that I figured I'd take a shot! 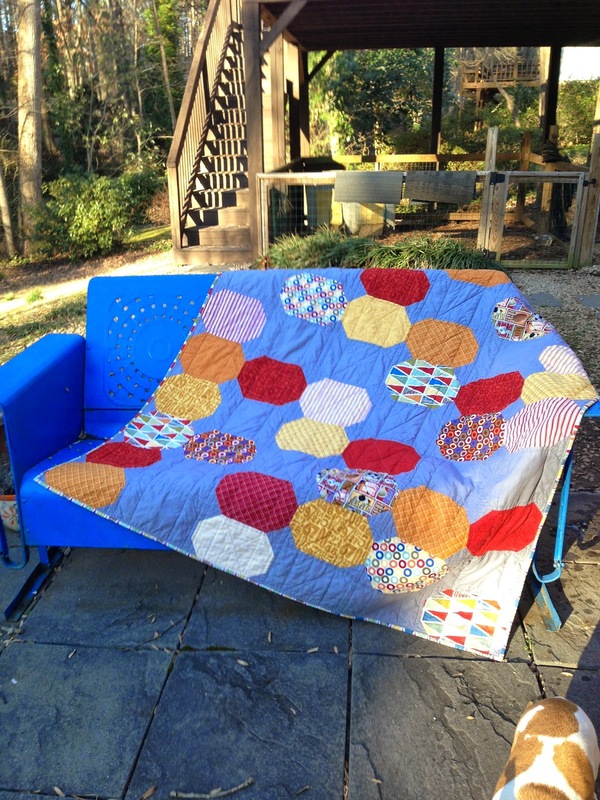 I got lucky on the photo: a quick morning shot of the quilt on my glider on my back patio with my little o' Iphone! 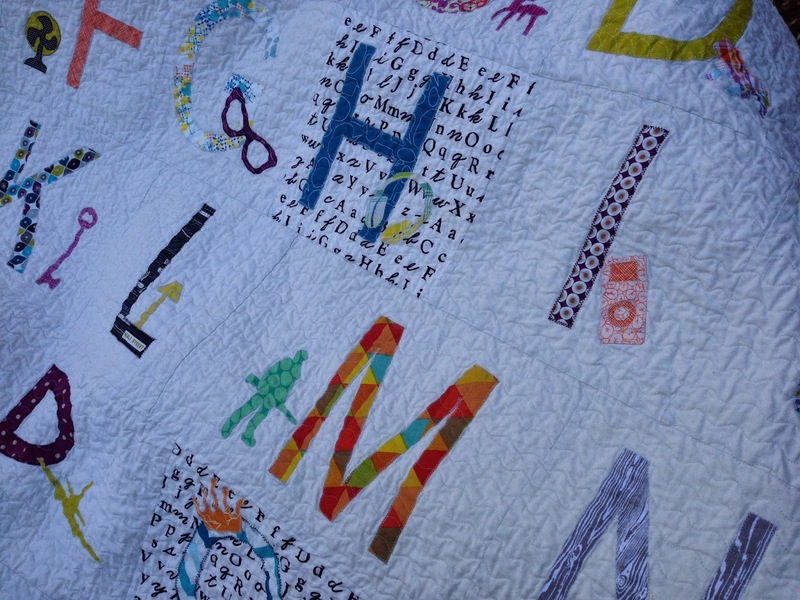 The story of this quilt: This is the March 2013 quilt for the Believe Circle of do.good.stitches. I asked my beemates to make Wonky Crosses in colors of blue, green, gray, yellow and orange. I assembled the blocks, quilted it and bound it. This was my very first foray into free motion quilting! Lots of fun, for sure, but not the prettiest job. But, good news is that once it was washed, the imperfections were far less noticeable. So, there it is! 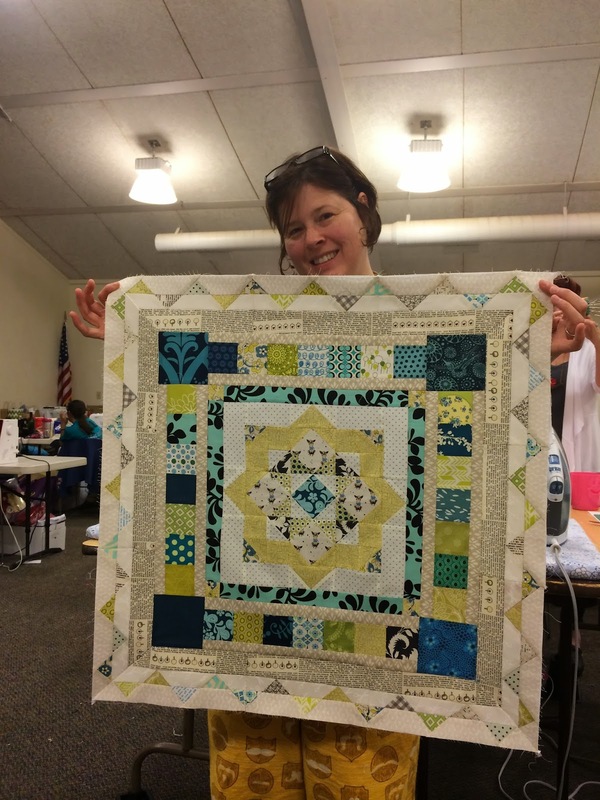 My entry into the Blogger's Quilt Festival. 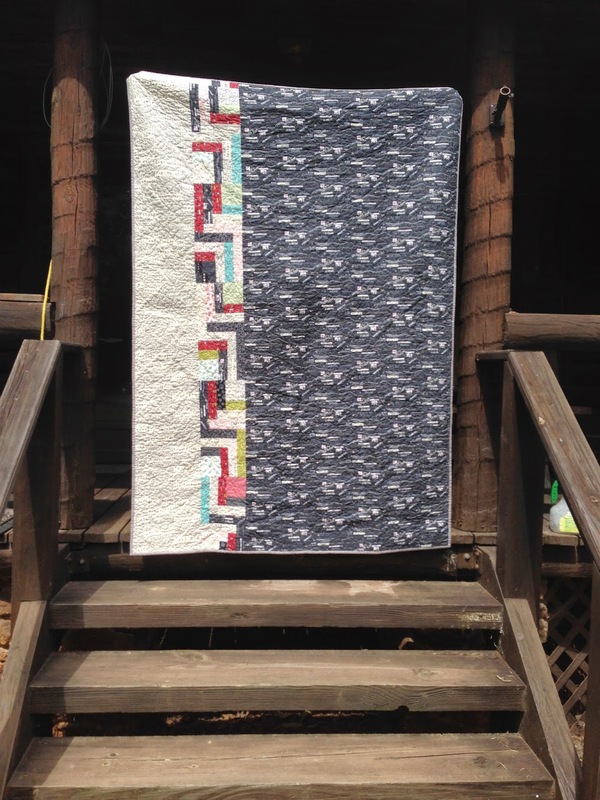 I also have my Churn & Dash baby quilt entered too, so go check that out! Enjoy all the eye candy and I hope you get inspired to make some awesomeness!